The Moment is a must-watch documentary for anyone interested in the history of Taiwanese cinema. If you’re interested in the history of Taiwanese film, The Moment: Fifty Years of Golden Horse is a must-watch documentary. Commissioned by Taiwan’s Ministry of Culture and directed by Yang Li-chou, it uses the Golden Horse Awards (Taiwan’s equivalent of the Oscars) as a lens for exploring the island’s cinema against a backdrop of social and political change. The first Golden Horse Awards were held in on October 31, 1962. From the very beginning, they had political underpinnings. For one, the name “Golden Horse” (金馬) is actually an combination of the first characters of Jinmen (金門）and Matsu（馬祖), two islands that were the frontline of Cold War tensions between the KMT government on Taiwan and the Communists in mainland China. Furthermore, October 31 was KMT leader Chiang Kai-shek’s birthday; only after his death did the award ceremony date shift towards its current time of late November/early December. 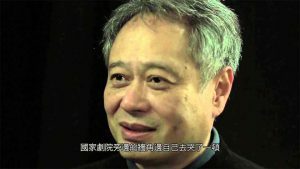 Ang Lee being interviewed for The Moment. As the Golden Horse Awards featured films from across the entire Chinese-speaking world (including mainland China after 1996), The Moment includes interviews with a vast array of A-listers from not only Taiwan but also Hong Kong, Singapore, and the mainland. Taiwanese actress Gwei Lun-mei narrates the entire documentary, and almost every prominent living Taiwanese director (Hou Hsiao-hsien, Ang Lee, Wei Te-sheng) has an interview slot. From Hong Kong, both Jackie Chan and Andy Lau make appearances speaking in Mandarin. Apparently director Yang and his crew interviewed so many luminaries that, in order to keep The Moment at an acceptable length, many didn’t make the final cut. However, what’s most intriguing about the documentary isn’t its abundance of prominent directors and actors. In one interview about his film, Yang stated that while the default for a “movie about movies” might be to focus on directors and actors, he wanted to focus on an group that such documentaries often forget: audiences. Thus, besides featuring luminaries, he aimed to document the impact of films on society and vice versa. The Moment takes this mission to heart. It divides Taiwanese cinema into stages and themes, linking each back to historical and social context. For example, Taiwan’s industrialization drove many oldest daughters to work in factories, and consequently romances featuring female factory workers also came into vogue. When the KMT government on Taiwan lost diplomatic recognition in the mid-1970s, a flurry of jingoistic war films stepped in to fill a nationalistic hunger. Beyond a simple clip show, however, Yang goes one step further and brings actual female factory workers, soldiers, and other “real audience members” in to recount what impact those movies had on their lives. These “audience interviews” are raw, emotional, and novel snippets of oral history that you rarely see in film histories. What’s also distinct about The Moment is its primary focus on Taiwanese cinema. Even when Hong Kong movies and actors appear, they do so to provide evidence for a statement or phenomenon from Taiwan. At least in English-language scholarship and media, Taiwanese film is often relegated to a subsections of broader works about Chinese-language or Asian cinema, and rarely comes with rich socio-historical context. My personal knowledge of Taiwanese film was gathered across a variety of disjointed sources, and I wish I had the chance to watch The Moment years ago to save myself lots of trouble. Even for those with less prior knowledge about Taiwanese film, The Moment represents an excellent way to dive into the topic. In fact, it’s probably one of the best sources that you could use for gaining a first-timer’s understanding about cinema in Taiwan as it covers 50 years’ worth in an easily digestible, summarized manner whilst introducing you to probably every title that’d be on the syllabus for a undergraduate course on the subject. As Taiwan’s movie industry has been on an upwards trend recently, perhaps more people in the West will use The Moment to learn about the society, history, and people, behind this island’s silver screen. The Moment – Fifty Years of Golden Horse (Chinese: 我們的那時此刻) — Directed by Yang Li-chou. First released March 2016. Running time 1hr 53min. Narrated by Gwei Lunmei.